" The High Five is back with $1.3M in guarantees at Americas Cardroom. It’s easy to get high at Americas Cardroom. Of course, we’re referring to the popular High Five Tournament Series, which returns from April 17th to 21st. You’ll find 5 daily tournaments for 5 days in a row and a total of $1,300,000 in guaranteed prize pools. With buy-ins starting at $1.05, everyone can afford to get high. The highlight is the $420K GTD Main Event on April 21st. Buy your seat for $420+30 or win your spot through one of the many affordable satellites running now. Either way, don’t miss your chance to take your poker game and bankroll higher. " 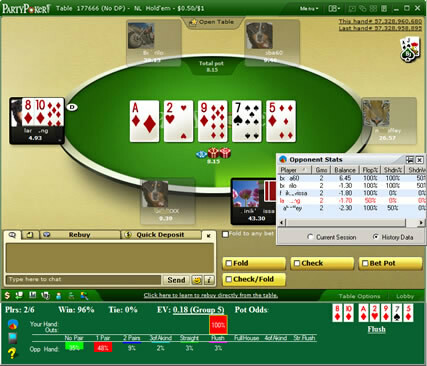 You may check out Holdem Indicator, Tournament Indicator, Omaha Indicator, iOmaha Indicator, Stud Indicator, and Mac Poker Calculator, the ultimate Poker Odds Calculator for online poker. Instantly calculates accurate win odds, pot odds and outs. Shows EV and Sklansky Group ratings for your hole cards. Opponent Stats helps you better understand your opponents' playing styles. You can even run Poker Indicator while you wait to sit at a table, collecting vital player information - before you ever risk a cent! NO other poker calculator on the market has this feature! Auto-displays your opponents' mucked hands at showdown, so there is no need to check the hand history. Shows the critical EV and Sklansky Group rating for your hole cards, which indicate how strong or weak your starting hand really is. This feature alone will save you money and again by preventing you from going on tilt. Displays total outs and the exact probability of hitting a particular hand. Clear pot odds display to help qualify your next move - check, raise, call or fold. YOU HAVE THE NUTS ALERT: Eliminates any confusion when you have the best possible hand. This way you can concentrate on how to extract the most money possible from your helpless opponents. Supports multi-tables at a time - NO other odds calculator on the market can do it! Supports over online poker rooms. Click Here for a complete list! Poker Indicator is an officially approved Poker Odds Calculator of PokerStars. No Spyware/Adware! Download the FREE trial version and start winning like a pro! Copyright©2005-2018 PokerIndicator.com, A Poker Odds Calculator Company. All rights reserved.